Jonathan Lynn is the writer/director of “Clue,” one of the top five most influential movies of my young life, and still an all-time favorite. By creating this witty, intricate cult favorite that has withstood the test of time, Lynn established himself as basically a real-life Sam Westing: the architect of a memorable game (inasmuch as a movie can be a game) full of colorful, plausible suspects who double as sleuths. “Clue” left a vivid impression on scores of movie fans, game fans, mystery fans, comedy fans – etc. The stuff of legend. So when Mr. Lynn followed me on Twitter, I felt a thrill as rare and exciting as a freshly prepared bowl of monkey’s brain soup. And it reminded me of an early experience of mine, when I was a young game designer and owner of a then-fledgling business. It’s not what you’d call a success story by most traditional measures but it’s an important part of our quest to find our purpose, professionally. Plus it has a happy ending. So here it is, for Jonathan Lynn and anybody else who cares to know how we fell on our faces but also ended up finding the solution against all odds. In 2009, only a few weeks into having started a business dedicated to real-life games of all different kinds, and with no background in business and no idea how to raise our public profile, we thought the shadowcast performance of “Clue” might be an opportunity. The thinking was, people who go to see “Clue” probably like games; maybe they’d like to play a game while they stand in line waiting for the movie to begin. And “ClueArt” was born. We prepared a simple trivia game with a scavenger hunt twist. We printed it on the front and back of a postcard-sized piece of paper. The trivia questions about the movie were tricky enough that even someone who had seen it many times would probably have to watch carefully to get the answers. Each answer was multiple choice, and every answer eliminated a room, weapon, or suspect: the same deductive mechanism as the “Clue” board game. The scavenger hunt component of the game was embedded in certain questions that directed the player’s attention to items we’d hidden around the theater, with the cooperation of management. An out-of-service chair told players not to sit on it, and also to be careful of KNIVES. Candy WRENCHES were sprinkled around the lobby concession counter. Players were directed to wave goodbye to the theater as they left; a message was put on the marquee while the movie was playing so nobody could solve the game completely until it was over. During the performance, someone in a penguin costume charged the stage. The actress playing Mrs. White feinted left, then right, then punched the penguin, who disappeared into the wings. That penguin was me. I was a much younger game designer then, with fewer inhibitions. Actually I have about the same number of inhibitions now, but I’m not going to midnight shows in penguin costumes any more. That chapter of my life is behind me. So that was the content of the game. What I haven’t mentioned yet is the graphic design and layout of the game, which was a horrible mess. I can barely stand to look at the card now, and I’m certainly not linking to it. Suffice it to say that many different fonts on a small space can be too much of a good thing. Greg does most of our graphic design these days (I designed the messy, cluttered game card in question) or, better yet, we outsource to the fabulously talented Ashley-Renée Nye, who married my brother but otherwise is above reproach. We gave away the cards to everyone in line and encouraged them to play and test their trivia mettle. The prize was free admission to a cell phone scavenger hunt we were running in Hollywood. Now the stage was set, the pieces in place. All we had to do was wait for the fun and games to begin. 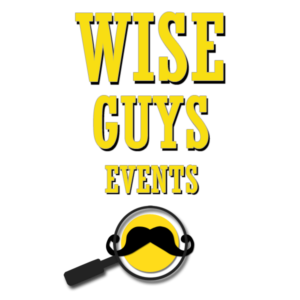 Players who had the solution – one weapon, one suspect, one room – were directed to email us for their prize. And the response? Silence. Not total silence: we got one correct response. We waited for more. They didn’t come. We were disappointed that our project, into which we had put quite a lot of effort, wasn’t met with the enthusiasm we had hoped for. Looking back on it now, I see a number of mistakes that we made, though our heart was in the right place. We wanted to share a game with like-minded playful folk, but we missed the mark. As an effort to galvanize viral interest in our work and build up our fan base, the project was an abject failure. But we did have a clear, undisputed winner. And that is where the story takes a more uplifting turn. 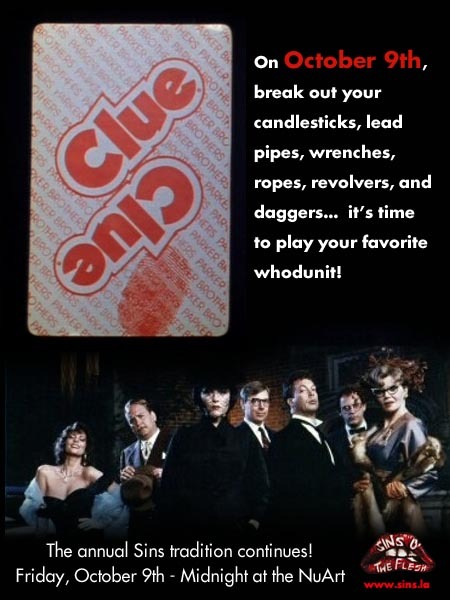 The “Clue” fan who submitted the correct response was a bright young lady from Long Beach named Jackie Riddle (her real name). Jackie responded with the spirit in which our game was meant and saw the fun in it despite its flaws. Jackie became a fast and early advocate for our newly-minted company and she stayed with us as we found out footing. A few years after the ClueArt project, Jackie became our first game master, hosting programs that Greg and I could not attend. And now, six years after that slightly embarrassing public misstep, Jackie remains our most experienced MC and an invaluable member of our team. For a business to grow, you have to demonstrate the value of your services to a vast number of people, and you have to have a clear, focused picture of who your customer is. But for a community to begin, you only have to connect with a small number of people. We put effort out there and it was met with a welcome reception by, at first, just Jackie. And then a few more. And then many more. And now we’ve got a team of 6 experienced game masters with whom we have run games for groups as large as 800 people. We’ve served international clients. We’re about to grow again. ClueArt was a long time ago. It wasn’t a success but it brought us one of our brightest stars, and I’ll always think of it fondly because of that. If the story had three endings, like the movie “Clue,” this is the one I’d choose. And, if you did in fact read this, thank you Mr. Jonathan Lynn for delivering your wildly funny and inspirational movie. And thanks for following me on Twitter. PreviousPrevious post:Press! The Benefits of Team BuildingNextNext post:Introducing: Santa-mazing-race-Monica!